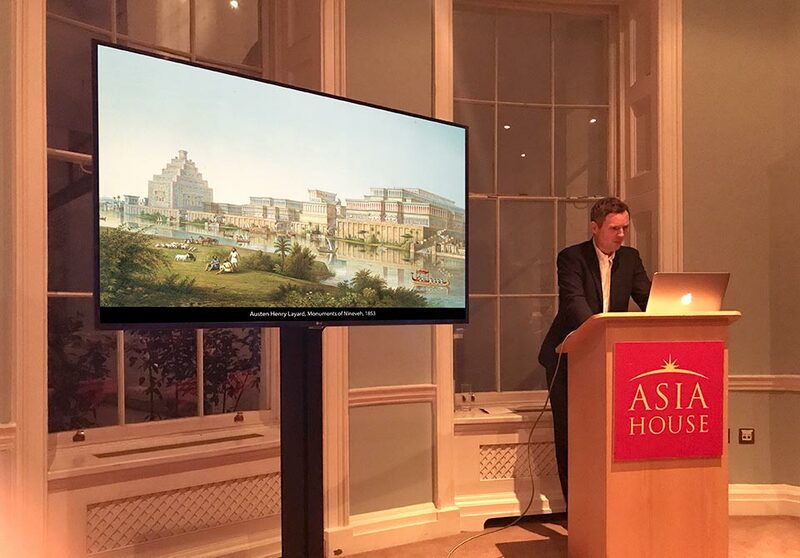 Asia House presented a talk by Gulan’s Creative Director Richard Wilding as part of their 2018 Arts and Learning Autumn Programme and to coincide with the opening of the British Museum exhibition I am Ashurbanipal: king of the world, king of Assyria (8 November 2018 – 24 February 2019). During his presentation, Wilding showed his contemporary photographs of Northern Iraq and Iraqi Kurdistan, alongside historical photographs taken by Gertrude Bell in 1909-11 and Anthony Kersting in 1944-46. He also featured the drawings and written accounts of 19th-century archaeologists such as Austen Henry Layard, and Jacobsen & Lloyd from the 1930s. Wilding also explored the various ethnic and religious groups that have inhabited the region, including Kurds, Arabs, Yezidis, Assyrian Christians and Jews. Wilding’s images and commentary explore traces of the region’s ancient Assyrian civilisation, its religious and ethnic diversity, history of persecution and renewal, and the crisis caused by the emergence of ISIS in 2014. The event was held in partnership with Gulan, and as a satellite event of Asian Art in London.